From blustery howling, whirling and rushing gusts to calm and smooth whistling winds, this natural winds library offers you a vast palette of the most pristine and wide sounding wind effects to create truly cinematic ambiences and sound designs. Scotland is famous for its rough nature and infamous for its winds. It's cinematic landscape of lush heathland, rolling hills and towering mountains surrounding the mystical Highlands take your breath away. This diverse landscape with almost no trees is perfect to record the atmospheric phenomena of wind. The small hills and hillocks were ideal to hide from the direct wind blasts and just record the pure symphony of wind energy transforming into sound. We drove all over the Scottish Highlands, about 2000km, to find as many different perfect recording spots as possible to deliver you the most versatile and complete rushing winds library out there. 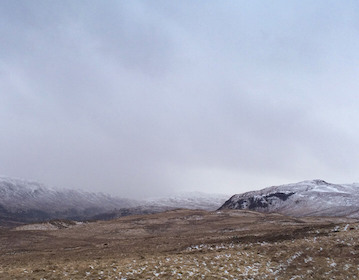 (Nearly) no birds were interrupting us, let alone humans, as we explored the wilderness and loneliness of Scotland. Only the wind was our constant companion. During our trip, we also got a lot of help by the remarkably friendly locals, who helped us to find some particularly special recording places. As mentioned before we are proud of our customized wide spaced omni rig (5 Sennheiser 8020 microphones), for our ears this system perfectly suits cinematic ambience and design needs. Before the actual recording trip, we took a lot of effort to make the rig wind and storm safe. To simulate these extreme wind conditions we tested the rig with custom build blower systems. The whole process took us weeks of tweaking and test recording until we were confident and finally ready to travel over the water and face the storm. Besides the discrete recorded 5.0 surround version, this library is also available in stereo to localize your game into any kind of windy and stormy environment!